Xiaomi Mi Note 2 Launched today. It showcases all the features, as suggested in several leaks. This phablet is absolutely ‘fabulous’. Find out all the details here! The much-awaited phablet by Xiaomi is finally here. The Chinese company took the wraps off Xiaomi Mi Note 2 today, at an event held in Beijing. The device had been talked about a lot, this year. The excitement over it was quite visible from the leaks and rumours posted online. We had news coming in every now and then, from every visible platform. Earlier this month, we talked about its possible launch in October end. Well, the company clearly kept its word. Its almost the end of October, and the phablet is out in the markets. Let’s find out what this ‘fabulous’ phablet has to offer! Some images leaked earlier, hinted towards the phablet’s curved display. The actual Xiaomi Mi Note 2 launched today, supports those images. The device sports a curved screen on each side. Both the front and rear panels of the device is covered by a 3D curved glass. The glass protects the ultra-thin, 5.7-inch OLED display, placed underneath.This is one of the most unique features of the phone. 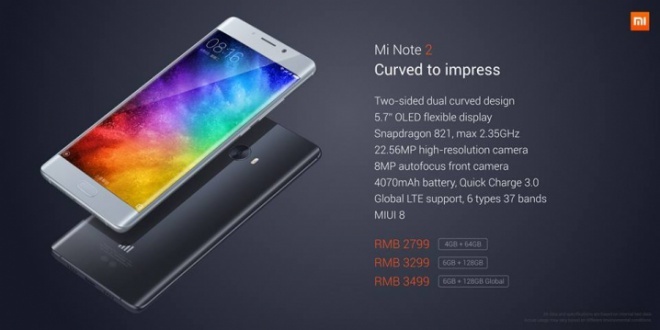 The Xiaomi Mi Note 2 launched, has a seamless and symmetrical exterior. This is what makes the device so distinct from others. It is powered by the latest Qualcomm SD 821 SoC, and runs on Adreno 530 GPU, with the capacity of 2.35GHz. Internally, the device supports 6GB of RAM, with an additional internal storage of 128GB. It is also available in another variant, with 4GB RAM and 64GB internal storage. Now, isn’t this amazing! Earlier, we had also shared some info regarding Mi Note 2’s promising camera module, with you. And, we must say, Xiaomi has delivered more than what was ‘promised’. The Xiaomi Mi Note 2 launched has an incredible 22.56 MP back shooter, with an aperture of f/2.0, a dual-tone flash and a phase detection auto-focus. Additionally, the shooter comes with Sony’s Exmor RS IMX318 sensor. The camera set-up on the phablet uses Electronic Image Stabilisation (EIS) and offers 4K video recording. The selfie-loving, 8MP front camera, comes with an autofocus. The Xiaomi Mi Note 2 launched has a powerful battery backup, too. It runs on a heavy 4070mAh battery and comes with a Quick Charge 3.0 support. The battery is extremely strong and can sustain for a long period of time. Apart from this, the phablet is equipped with 192kHz/24bit Hi-Fi sound quality and an NFC support. The device has the potential to hold global LTE bands, that are 37 in number, with 6 different variations. 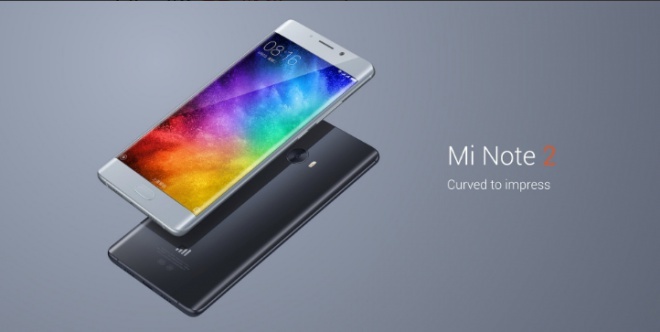 Xiaomi claims the phablet to be the ‘perfect fit’ for the users’ hands. The new Xiaomi Mi Note 2 launched is available in two classy shades-Piano Black and Glacier Silver. The latter variant is quite unique, as it reflects various colours when seen in different lighting conditions. You can grab the 4GB RAM with 64GB memory variant, at an exclusive range of 2799 Yuan (INR 27618.16 approx.). The 6GB variant is available at 3299 Yuan (INR 32551.98 approx.). A global variant with 6GB RAM is also available for purchase, at 3499 Yuan (INR 34525.17 approx.). So guys, what are you waiting for? Get hold of the amazing Xiaomi Mi Note 2 now! We have some exclusive images of the device to keep you motivated. Check them out!